A mark must not be placed anywhere for the purpose of indicating a line of putt. A ball on the putting green may be lifted and, if desired, cleaned. The position of the ball must be marked before it is lifted and the ball must be replaced (see Rule 20-1). The question that some players have is whether a ball that has been replaced at the ball-marker is in play even if the ball-marker has not been removed. The short answer is that it is. 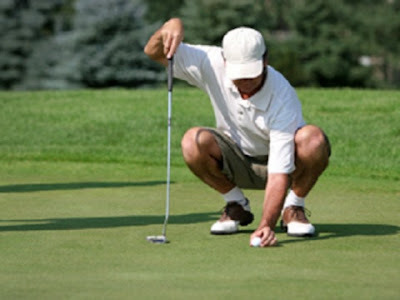 There is no restriction as to how many times a player may mark, lift, clean and replace their ball on a putting green. So, when a ball is replaced at a ball-marker it is in play, even if the ball-marker is not removed, but as soon as the player touches it again, perhaps to align it, it is out of play and as soon as they let go of it, at rest against the ball-marker, it is back in play, etc.. Whether the ball marker is removed or not is not relevant to whether the ball is in play. Q. A player marked the position of his ball on the putting green and lifted the ball. When it was the player's turn to play, he could not find his ball-marker. Subsequently, he found the ball-marker stuck to the sole of his shoe. He concluded that he had accidentally stepped on it while assisting his partner in lining up a putt. What is the ruling? A. The player incurs a penalty stroke under Rule 20-1 which requires that the position of a ball be marked before it is lifted, and contemplates that the ball-marker will remain in position until the ball is replaced. The player must place the ball as near as possible to its original position but not nearer the hole - Rule 20-3c. Under the last paragraph of Rule 20-1, a player is exempt from penalty if his ball-marker is accidentally moved in the process of lifting the ball or marking its position. In this case the ball-marker was not moved during such process. So, returning to the original question, if the player cannot find their ball-marker they incur a penalty of one stroke and they must estimate where their ball was at rest before being marked and place the ball there, ensuring that it is not placed nearer to the hole. In other words, the player should err on the side of caution when estimating the place to replace their ball, to ensure that they are not taking an unfair advantage. Note that there is no five minute time allowance in The Rules relating to a player searching for a ball-marker. Depending on the circumstances, it is probable that a player who does spend several minutes looking for their ball-marker should incur the general penalty under Rule 6-7, for undue delay. As I recently mentioned, I now intend to blog every two weeks rather than weekly, unless something really interesting happens at a Tour event that I cannot let pass. However, many readers will continue to receive my separate Rhodes Rules School emails every week; I am just starting the 4th series. If you are not yet subscribed and would like to improve your knowledge and understanding of the Rules of Golf, then click on this link to subscribe or click on this link for more information. The above content is strictly copyright to Barry Rhodes © 2016 and may not be copied without permission. Don't like your reference to the ball "against the ball marker". There is no requirement for the ball marker to touch the ball. On what basis are you penalizing this player? There is nothing to support the assumption that he accidentally moved his marker (which is present in the decision you referenced). "Decision 20-1/5.5 does not deal with this exact circumstance, but I believe that the principle in the answer is relevant;"
I think that you will find that there is no Decision on this particular circumstance, so one has to work on principles deduced from similar circumstances and Decisions. I would be most interested if you have an alternative ruling that you can support, expecially if you dispense with your anonymity. One of the issues arising re the use of a ball marker that I have never got a straight answer on is the following "a player marks his ball, cleans and then replaces it close to the marker but then accidentally touches and moves the ball when lifting his marker", the question is whether in doing so does he incur a penalty or can he simply remark his ball and replace it in the original position without penalty? If a ball or ball-marker is accidentally moved in the process of placing or replacing the ball, the ball or ball-marker must be replaced. There is no penalty, provided the movement of the ball or ball-marker is directly attributable to the specific act of placing or replacing the ball or removing the ball-marker. Barry, Please check out the January issue of Golf Magazine, Rules Guy page 10. In this case the player could not find his old penny on the green so he was allowed to replace his ball on an estimated spot with no penalty. (Don't understand how a person could estimate the spot but not find the marker unless it has been moved via sticking to his or someone else's shoe) This seems similar to your scenario with a different answer. What do you think??? Several other subscribers have drawn my attention to this 'Rules Guy' ruling, which I understand did not come with any reference to any Rule or Decision, to support it. In the absence of any official ruling, I am sticking with my belief that a penalty of one stroke should apply. Let me make another point. If a player spends 2-3 minutes looking for a 'lost' ball-marker, which is far longer than the recommended longest time for assessing and making a putt, then the player should probably incur a penalty of two strokes for undue delay of play, Rule 6-7! This second penalty would cancel the need for the penalty of one stroke. Also, I find it difficult to believe that a player who cannot find their ball-marker, which could possibly be on the other side of the green from where they are looking for it, if they had a 'senior moment', can place their ball anywhere they choose (with the acquiescence of fellow competitors, who just want to get on with their game) without incurring a penalty. Got to agree with you! Unless you have VC that a FC or OA has moved the marker, the player has to get some sort of penalty. The player knows the approximate place under the ball and did not find the net. Why do apply the 20-1 / 5.5 and can not be considered to be as indicated in the 20-1 / 9? In Decision 20-1/5.5 it is known that the player caused their ball-marker to move. Similarly, in Decision 20-1/9 there is evidence that the ball marker was moved by an outside agency. In the circumstance of the blog, there is no evidence that anyone moved the ball marker, but it cannot be found. So, it is not known whether it was moved by a player, a caddie, an outside agency, an element (wind), or if it is still lying in the same place that it was originally placed, but the player is looking for it in the wrong place. Today was a windy day with the arrival of Storm Ophelia, and I wonder if Barry could clarify a small point about wind moving a ball on the putting green. The situation that occurred today was that in windy conditions I left my first putt 4 feet short of the hole. I marked the ball and - as is my custom - aligned the logo on the ball with the expected line of the 4 foot putt. However, within a second or two of picking up the marker a gust of wind of wind rolled the ball approx. 1 inch to one side so that the logo that was helping me with the line of the putt was no longer in clear view. My question is whether I am allowed to remark the ball in its new position in order to realign the logo with the putt, or have i lost the right to remark the ball after the wind has moved it? After some discussion with my playing partners I did not remark the ball, and I holed the putt, so no damage was done. However I would still like to know whether I had the right to remark, and realign the logo, or whether I lost the right to do that after the wind moved the ball. The Rules do not restrict the number of times a player may mark and lift their ball on a putting green, so you were entitled to move the ball-marker to mark the ball at its new position and then re-align the ball to the intended line of putt.